“Haw-w-w-w-w!” That sound can only mean one thing—that marvel from Boonetown, Iowa is back causing more trouble than he’s worth! That miscreant of Calamity brings down a well-known Von and the higher-ups feel he should be sent Stateside to go on the lecture circuit to drum up enlistees. Problem is, he only makes it as far as Jolly Ol’ England where he comes upon a Boche Zeppelin. It’s “Fish and Gyps” with a “flying cigar” for dessert! 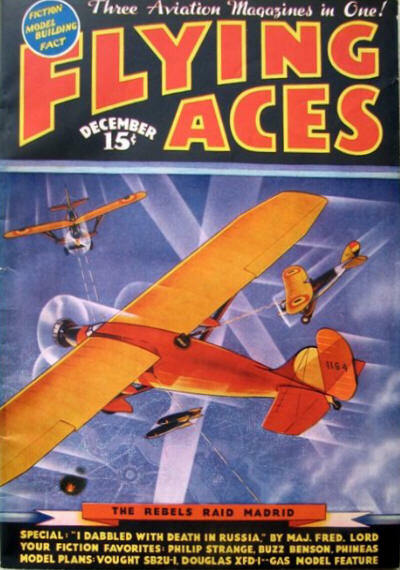 It’s another Phineas Pinkham laugh panic from the pages of the September 1936 Flying Aces! 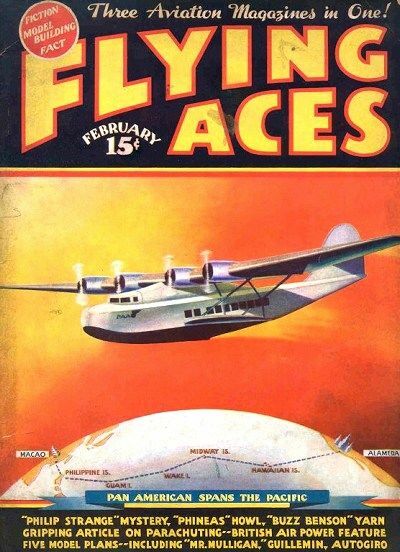 “Hail, the Conquering Hero Comes!” To those rousing strains, the Brass Hats paraded Phineas back to the States. And so, Garrity rejoiced as peace finally reigned once more on the drome of the 9th. But how was the Major to know which way the Pinkham parade was headed? And who’d have expected the von Sputzes to supply that parade with its main “float”? 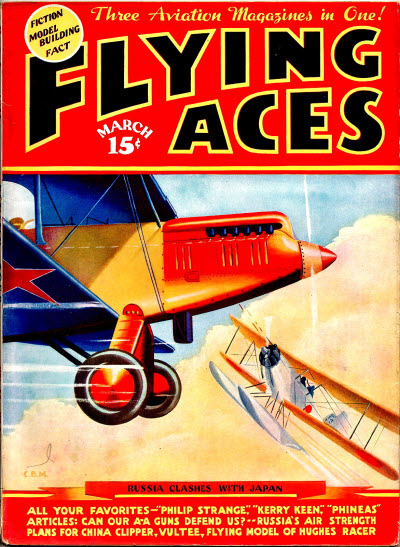 Phineas hadn’t figured on a flight from the back of a mule instead of from the drome of the 9th. And the gallant Garrity hadn’t figured on getting stuck when he put adhesive tape on his francs. Anyhow, they called out the guard. But what’s the good of jailing a Jekyll if you haven’t hamstrung the Hyde? A flank movement by Flanagan started it. Then von Bull horned in. But Phineas knew that a man’s best friend is his pooch. And though it isn’t news when a dog bites a man, it certainly was when Napoleon, Josephine, Danton, and Dubarry sunk their incisors in poor Rollo. “Haw-w-w-w-w!” That sound can only mean one thing—that marvel from Boonetown, Iowa is back causing more trouble than he’s worth! That miscreant of Calamity manages believes he has a sure thing goin’, but overplays his hand andgets not only himself in hick, but practiaclly the whole of the Ninth including the Old Man! 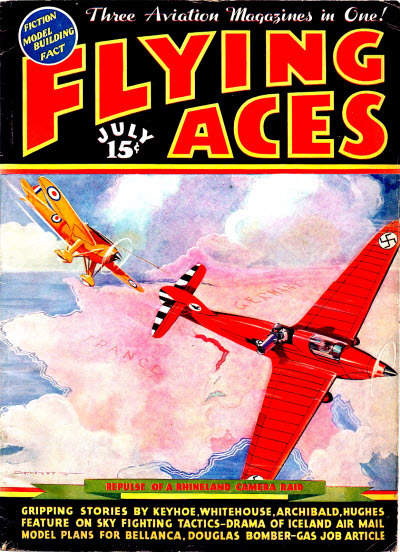 It’s a case of “cash-and-miscarry” ala Carbuncle in “Sky Finance” from the pages of the June 1936 Flying Aces! Battling Casey, the Ninth’s famed ackemma, needed a fight trainer, so Phineas assumed the role—and he figured on assuming the roll of a couple of Limeys into the bargain. But when the leather pushers squared off, the Iowa Impresario found his man entered in the weight-lifting events. Moral: It’s easy to don the leather, but you can’t always push it. Wing made a whopper in 1918! 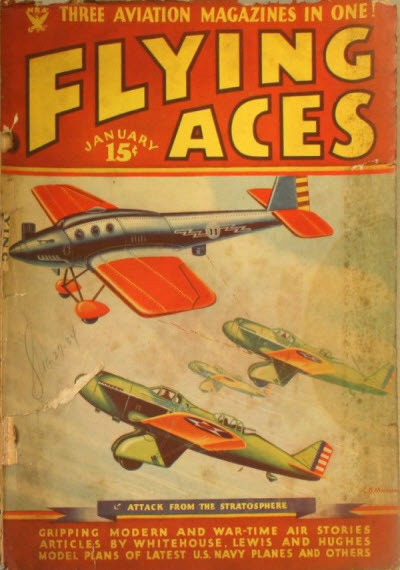 They sent America’s leading ace into the same sector with Lieutenant Phineas Pinkham, who certainly had not been a shrinking violet in the fight to save the Democrats. 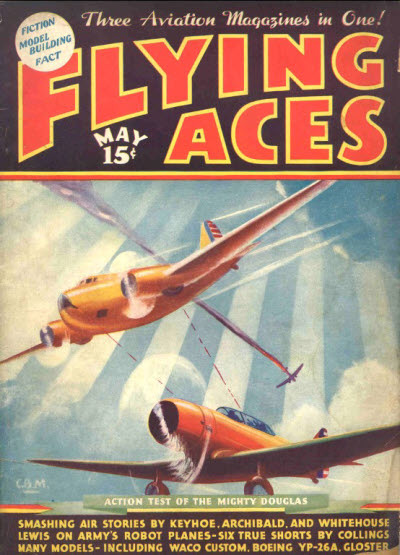 Morever, the war correspondents were instructed to ballyhoo the aforementioned ace at the slightest provocation. 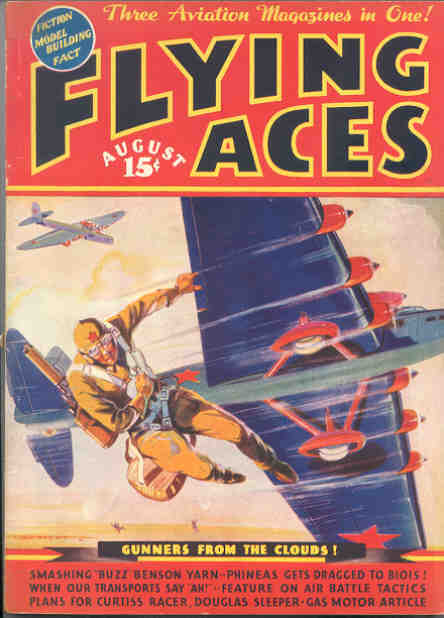 He was to be built up as the foremost Boche obliterator wearing the colors of Uncle Sam, despite the fact that Phineas Pinkham had snagged a flock of honest-to-goodness aces out of the hostile pack with the finesse of a gambler in a gold rush mining camp. Something had to happen. When two champion mauling bull elks find themselves in the same woods, all the lesser wild life move out until the battle is over! 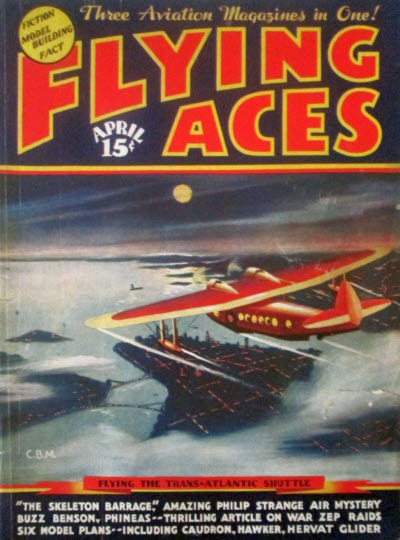 The Yank Brass Hats made a great mistake in leading an Ace when the Boonetown Joker was still in the deck. 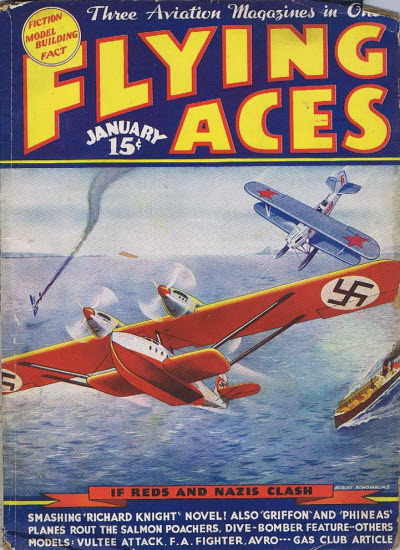 And matters got worse when the Krauts opened up with a mile-high variety of the old shell game. Only on that last play, the Heinies forgot to look under the shell! “Haw-w-w-w-w!” That sound can only mean one thing—that Bachelor of Artifice, Knight of Calamity, born on April Fool’s day and reared in raillery, an alumnus of Doctor Merlin’s Camelot College for Conjurors is back and this time the marvel from Boonetown runs for the looney bin rather than face the German’s latest and greatest invention—a bullet that can destroy a plane in one shot! Once he got a taste of von Kruller, Phineas would be finished—according to the way the Krauts figured. But the Boonetown Prankster’s interest was in nuts, not doughnuts. And you can’t beat a combination like Charlemagne, Julius Caesar, Disraeli, and Columbus when you’ve got Marshal “Carbuncle” Ney on the board of directors. “Haw-w-w-w-w!” You heard right! That marvel from Boonetown, Iowa is back! 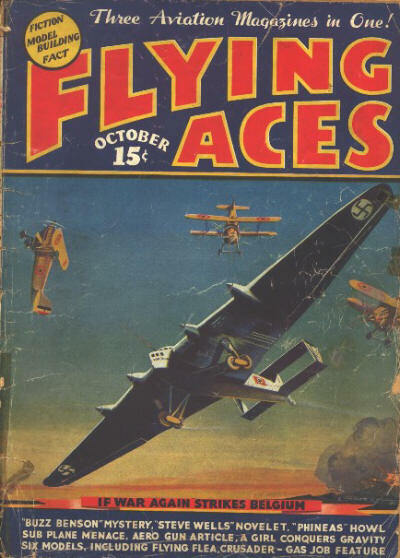 And this time we find that Knight of Calamity finds himself shrieking amongst the sheiks in “Doin’s in the Dunes” from the pages of the March 1936 Flying Aces. Foreign Legionnaires, it was true, swallowed corosive cognac without batting an eye. But they choked when the Kraut Intelligence agents added Abd-el-Fizz to their diet. It was then that the action in Morocco got fast. And it got even faster when Phineas met Beni Hazzit—and let him have it! “Haw-w-w-w-w!” That sound can only mean one thing—that Bachelor of Artifice, Knight of Calamity and an alumnus of Doctor Merlin’s Camelot College for Conjurors is back and this time the marvel from Boonetown is caught between two woman and finds himself the guest of honor at a T.N.T. party! 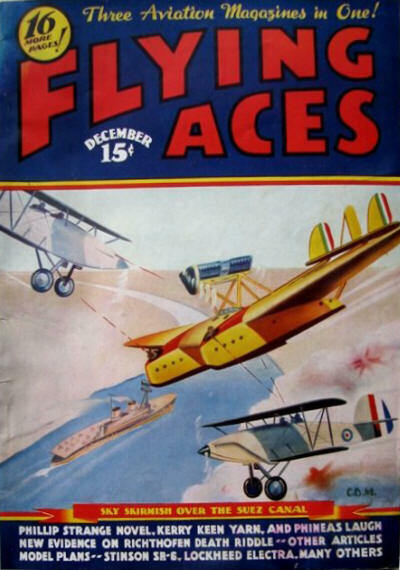 From the February 1936 issue of Flying Aces it’s “T.N.T. Party” (with Phineas serving the lemon!). Now that the great Mata Hari had been filed away via a shooting squad, the guerre would be a lot easier for the Allies. Phineas knew that. 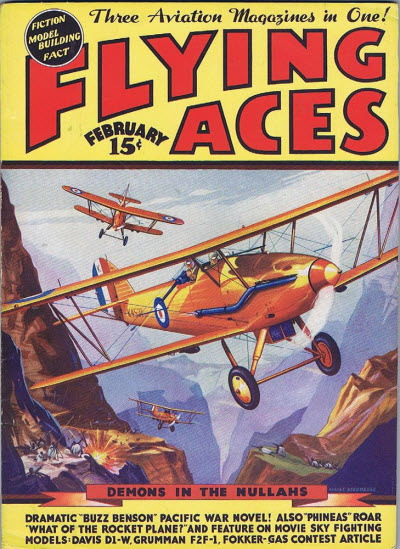 But the Boonetown Bamboozler didn’t know that his John Henry was on the flight schedule for a high altitude solo trip—one without his Spad. “POWERFUL KATINKA” had been upsetting the Allied apple wagon for days. Powerful Katinka was the name of a Heinie gun battery which had been set up about a mile from Mont Sec. 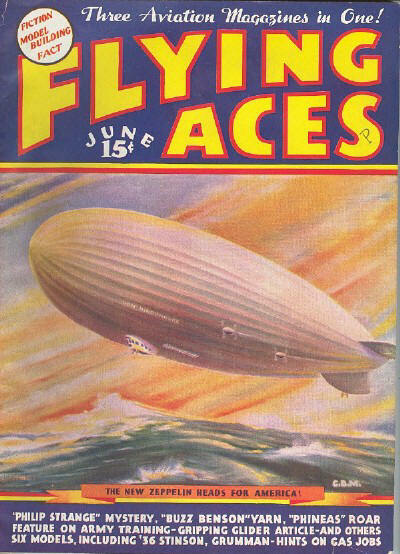 The Yanks had christened it thus. It was no ordinary Archie battery but one that was more efficient than it had any right to be in the year 1918. The brass hats at Chaumont suspected that the Krupps had uncovered a tow-headed Teuton prodigy who had passed trigonometry at Heidelberg with an average of one hundred and fifty per cent. 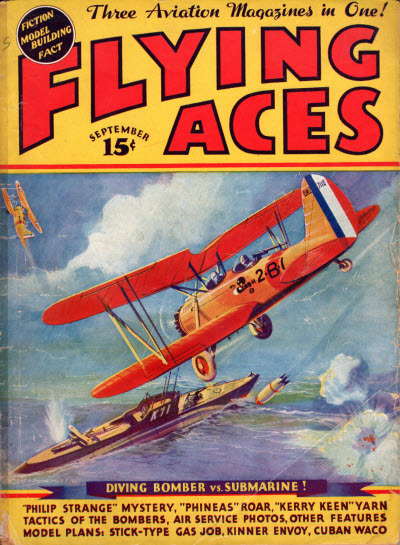 When shrapnel could tag a Spad, flying top speed, two out of three bursts, then something had to be the matter. In three weeks time, Powerful Katinka had sent five Allied ships to the cleaners via the scrap iron route. Of course Chaumont could only think up one slogan. Get that blankety-blank gun! They had not thought up how. That was up to the Air Force. And you just know Pinkham’s gonna stick his nose or something in it! The brass hats decided their auto was running on gas—but they didn’t mean gasoline! And though Phineas always claimed his ghost would come back to haunt Major Garrity, what chance had the Boonetownite’s spectre in competition with the ghost of last month’s English breakfast?